Our Halloween started off rough, with the death of Dylan's pet frog. Luckily, we were able to cheer Dylan up, and have a good day. We started off with a Halloween-themed brunch. We had eggs, bacon, and toast. I cut the toast out in Halloween shapes. Brunch was served on Halloween placemats, with a treat bag next to the settings. Dylan got some legos, and Lexie got a Halloween Polly Pocket, and their toys kept them busy for the next few hours! We went Trick or Treating in the town Grant grew up in. 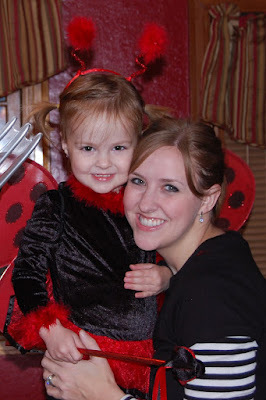 This was the first year that the kids really enjoyed trick or treating, and they lasted over an hour and a half! They both came home with tons of candy, most of which they will not eat! After Trick or Treating, we briefly visited my parents, so they could see Lexie and Dylan in their costumes. While we were there, Lexie decided to have another dance party! She was full of energy on Halloween night, and it wasn't from the sugar! I finally got the kids rounded up, and was headed out the door, but we didn't get very far! What were they so excited about? My parent's neighbors LOVE fireworks, and set them off every chance they get! After a 20 minute fireworks display, I was able to take my kids home. They didn't last much longer after that. Grant's parents and nannie didn't get a chance to see the kids in their costumes, so Dylan and Lexie got to wear them again on Sunday! I'm so happy they had a good Halloween this year! You had two very cute trick-or-treaters!!! They both look so cute! Sounds like a fun day! Have a great week. They are adorable! I love the pictures, looks like everyone had a blast! Love the pictures and the costumes. How cute is the picture of her in her undies looking down at her feet. So cute! Looks like they had a full day! She looks like she's got some moves! Oh wow, LOVE their costumes! And that picture of you and Lexie is beautiful. =0) You both look so beautifully happy! Glad y'all had a great night! How cute! I love the pictures of Lexie dancing ... precious! Ok Lexie's costume is the best little girl's costume ever! Both of there costumes are super cute! Glad they had a good time! what a great halloween. Oh my! your husband and that costume!